The Prankster has received significant numbers of complaints from motorists who received parking charges from Excel Parking even though they purchased tickets. When they appeal, Excel claim to have no record of their purchase and therefore dismiss the appeal. Today, at least one of the reasons why their machines fail has become apparent. A motorist visited the Peel Centre for a KFC. Although the Peel Centre is one of the worst signed car parks in the country, his years as a Fast Jet pilot allowed him to take in large amounts of poorly presented yet critical data (their signage). HI therefore bought a ticket. Although he checked that his registration was correctly entered, he did not check the rest. This is what he received. Pay attention to the date of issue. 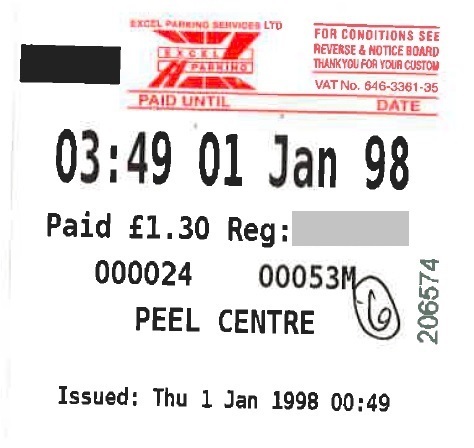 Excel Parking were only awarded the contract to manage the car park on 1st October 2012, so issuing a ticket in 1998 is obviously impossible. The Prankster therefore thinks the following is happening. On occasion, a pay machine will encounter an error and reset itself. When this happens, the date resets to 1 Jan 1998 00:00. The machines should synchronise themselves using NTP or some other method, but this obviously does not always happen. From the time on the ticket it appear the machine has failed to synchronise for a considerable period - 49 minutes. The ANPR cameras are not synchronised correctly with the time on the pay machines. So when Excel download the data from both ANPR and pay machines they find a vehicle which parked in 2016, but no matching payment; the payment of course, according to them, happened in 1998, which is before their contract even started. Excel issued the motorist with a parking charge. Luckily the motorist had kept the ticket, and was surprised to find the error. 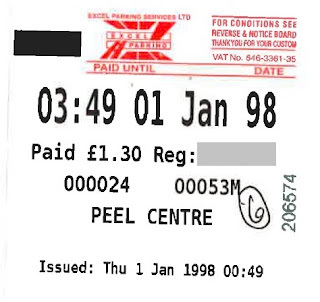 The motorist appealed to Excel, sending a copy of the ticket. Any reasonable person would now expect Excel to cancel; however this does not take into account the greed and lack of morality of their owner, Simon Renshaw-Smith. Excel refused the appeal on the grounds that the motorist ‘did not comply with the Terms and Conditions of parking by failing to purchase a valid P&D ticket’. Excel's view is that if their machines issue faulty tickets then it is the motorist's fault and not theirs. The motorist should minutely scrutinise their ticket and if there is any mistake they should accept the loss of their money and leave the car park. The Prankster's view is that this would lead to the absurd situation where Excel make more money when their machines have faults than when they are operating properly. Given the frequency which the machines are out of operation at the Peel centre it appears that Simon Renshaw-Smith has come to the same conclusion and he prefers to rake money in by running poorly maintained and/or out of date systems than by running a proper parking operation. As the IAS is to all intents a kangaroo court and is staffed in The Pranksters opinion, by assessors who are either corrupt or incompetent, led by the inept and bungling Bryn Holloway there seems little point in appealing to them. Instead, The Prankster suggests contacting the manager of the Peel Centre, Adam Jolley, and ask him to get the charge cancelled. His email address is a.jolley@peel.co.uk. Alternatively his colleague Nicola Dearden may also cancel the ticket. Excel think that motorists should pay when Excel's payment systems fail. The case of Excel Parking v Mrs S. C8DP11F9, which also concerns a ticket failure at the Peel Centre, suggests the judiciary think otherwise. Given this state of affairs, there was no just cause for Excel to have applied for keeper data from the DVLA. Their machine failure is their own responsibility and does not excuse them. There has therefore been a possible breach of the Data Protection Act, and the motorist can potentially sue Excel for this. An amount of £250 would normally seem to be appropriate. However Excel have compounded this by continuing even when their own mistake is pointed out, which means a larger amount would not seem amiss. The Prankster suggests considering banging out a letter before claim at the appropriate time. I would suggest that there is a purpose to appealling to the IAS. Not on an individual level - as you rightly say, they are nothing more than a kangaroo court. However, they ARE the supposedly independent appeals service for the IPC, who in turn are an Accredited Trade Association. Every time a motorist declines to use their services is a missed opportunity for them to disregard established law. It seems to me that every time a motorist has an appeal on a point which has already been established in court, an appeal should be presented to the IAS on that basis. When the appeal is inevitably refused, the motorist is no worse off, and when he wins on that same appeal point in court, this should generate a complaint to the IPC and DVLA about their appeals service ignoring clearly established points of law. After a certain number of complaints, the DVLA must surely find themselves with some difficult questions to answer with regard to the continued accreditation of an association with such a clear disregard to the law they claim to abide by. I agree with the above, it's all about statistics. Lets start to boost the rejection levels of their appeal system. By giving them enough rope, maybe they'll hang themselves !